Boy meets girl, again. Nine years later. It is not often that one gets a chance to revisit likeable characters from a film which is not an obvious candidate for a sequel. Before Sunrise presented us with Celine and Jesse, a pair of smart twenty-somethings that made an impression on the audiences. The movie was a moderate success on the big screen but not enough to motivate a sequel for monetary gains. The former was almost an experiment trying to break from the conventional mold of romantic films. It follows an American boy and a French girl through the streets of Vienna on the night they first meet. They part ways at the end with a promise to meet after 6 months in the same place. 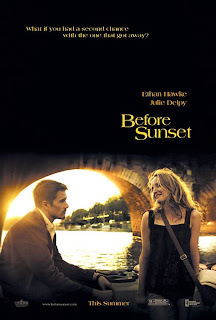 Before Sunset places us about nine years into the future from that point; this time in Paris. On a summer afternoon, Jesse is promoting a book he has written about the fateful night in Vienna. As he is discussing the book and taking questions at a famous literary landmark (Shakespeare and Company) in Paris, he notices a familiar face in the back. It is Celine who read about his appearance and came by to meet him. He has a flight to catch in a couple of hours and the movie slips into real time as the two try to catch up on the past decade of their lives. Jesse is in a failing marriage and has a young son to whom he wants to provide a role model. Celine is an idealistic activist working for a cause she believes in but appears to be a bit jaded. The conversation begins with a bit of expected awkwardness but they quickly settle into a smooth flow, quietly reiterating the compatibility they share. There are the obvious questions that need to be answered: what happened in Vienna 6 months after they parted? Did one of them not show up? And why? All of these are addressed rather promptly so that the narrative can move forward rather than pursue a conventional climax. It is evident that the meeting in Vienna never took place but that night certainly left a mark on both of them. In his case, Jesse has written a novel about it which makes it obvious. In her case, the impact is revealed in a song she has written and chooses to play for him later. The conversation, while engaging, is not the key focus as in the earlier film. Here, Linklater achieves something more refined. He captures the way they converse more intimately than before. It is a delight to observe the two characters (and actors) playing with what they choose to reveal to (and conceal from) each other. The audience gets to notice gestures by one character when the other is looking away. Being in one of the best cities in the world to walk about and have a coffee, certainly adds to the atmosphere of the film on a lovely summer afternoon. Linklater builds up the meeting to a fitting cliffhanger of a climax which leaves one wanting to hang out with these two for just a little bit longer. Linklater’s experiment certainly pays off.